Economy versus the Environment. This is a slogan for many when they consider the challenges of dealing with Climate Change and the reduction of greenhouse gas (GHG) emissions. In 2007, McKinsey issued Reducing US Greenhouse Gas Emissions: How Much at What Cost? that provided a a significant contribution to this discussion. McKinsey’s conclusion: at an “affordable” cost of well below $50 per ton, in aggregate, the United States can meet necessary 2030 targets for GHG emission reductions. All-in-all, this was quite good news for those advocating acting to deal with Climate Change. There was (and is) reason why the original study and McKinsey’s continuing work in this arena have been widely discussed / cited over the past two years. 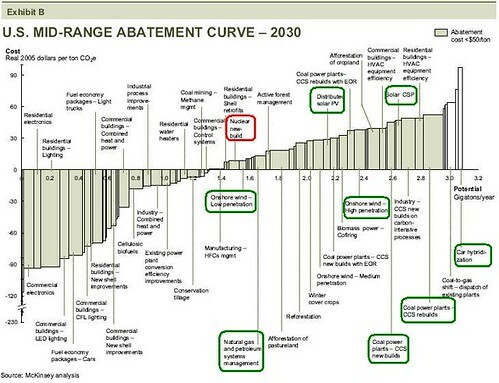 And, variants of the graphic on cost abatement have shown up in briefing after briefing, article after article, book after book. Good news. Or, well, is it? McKinsey’s work provides significant data that addressing the environment will have economic cost. Even if a low number, with many actions providing economic benefit, the McKinsey work has a serious underlying thematic: it will cost to address climate change. A crash program to improve the energy efficiency of American homes, offices, and factories could slash energy consumption by 23 percent by 2020 and produce $1.2 trillion in savings, according to a report by the McKinsey consulting firm. McKinsey said that taking steps such as better insulating buildings, replacing old appliances, and sealing ducts is the fastest and best way to cut the country’s energy consumption. The firm recommended an investment of $520 billion in energy efficiency programs over the next 10 years, an amount that dwarfs the $10 billion to $15 billion included in the Obama administration’s economic stimulus package.